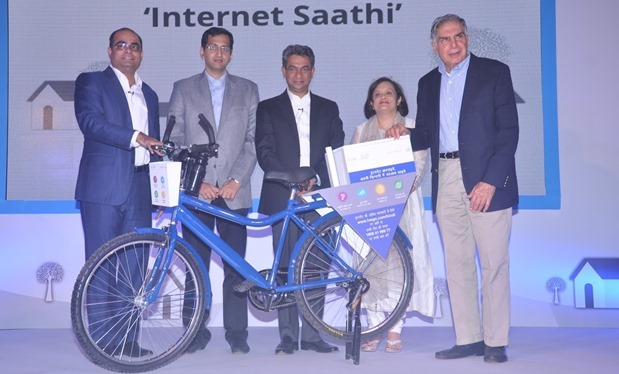 Internet Saathi, A Initiative By Google, Intel And Tata Trusts to Bring More Rural Women Online. The theme of “Woman Empowerment” has rocked the Indian landscape extensively since the year 2014. With power packed performances on and off screen, today’s woman is pushing for her “choice”. In this awakening, the Digital India Program has also risen to the occasion with it’s new agenda for the rural women called “Internet Saathi”. The old adage termed by the American leader, Brigham Young, “You educate a man, you educate a man. You educate a woman, you educate a generation” is still relevant in our country’s context today. This newly formulated initiative wants to bring about an awareness on the usage of internet among women in rural India. Statistics analyzed by Google says that though India is rapidly adding internet subscribers by every passing day, only 12% of the rural women population are using internet. This one of the prime reasons why this initiative called “Internet Saathi” has been introduced that will bring internet to their doorstep to educate the rural women. When we say doorstep, we mean it. The deliverance of the basic usage of internet and benefits of using internet will be departed through specially designed cycles which will have the computer equipment fitted on the back of the cycle. This kind of a model will make it easier to carry around and that way, the government estimates it can reach it’s target of 4500 villages imparting education to around 5 lakh women in 18 months. This is a joint initiative by Google, Tata Trusts and Intel to make this proposition a reality. This internet literacy campaign for women was announced on July 3rd and as per the plan these internet enabled traditional carts will start off in Gujarat, Rajasthan and Jharkhand in 1000 numbers. These carts will travel from village to village by halting in a village for 4 to 6 months wherein the basics of the working of the internet will be explained at least for 2 days every week per village. The women will be provided with working knowledge, training sessions and materials so that they can use the internet without any assistance. An elated, Ratan Tata said, “I’m delighted that the Prime Minister has decided to give so much preference and priority to the fact that India will be a digitized nation. Internet will help educate India, will give access to livelihood to many women who do not have a formal livelihood, help reach out commerce to far parts of India.” The top business houses have vowed to invest around Rs. 450,000 crores for the Digital India Initiative. Google has been working with the government on many such digitalizing initiatives and is proud to be a part of this internet revolution in India. Intel has been working on the same line with Google on it’s “Helping women get online” initiative which was launched earlier in September, 2014. Google had roped in Intel, HUL and Axis Bank for it’s “Helping Women get online” initiative which by far has seen a great increase in interest and usage of internet among women in rural areas. Another simultaneous campaign called “Reach for the Sky” was also introduced with actor Farhan Akhtar’s initiative called MARD to accelerate the growth of internet literacy. And now with government too standing up for this cause, we have to wait and watch how it’ll all work out.